Are you aware that sports bikes are short stroke for better performance? thats because, like F1, they use super high rpm to make power with their limited displacement. 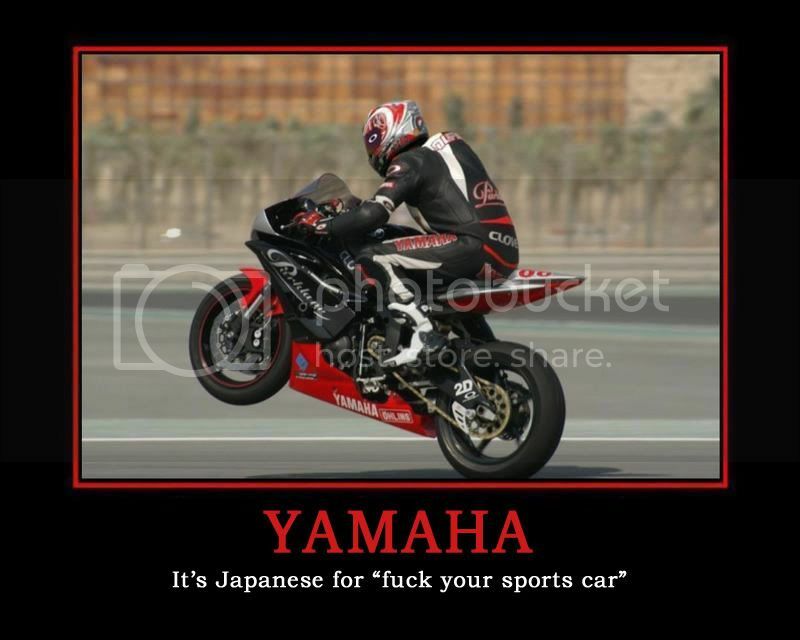 sportbikes are much closer to their racing counterparts than cars. as such they are designed with racing classes in mind. for example the death of the 750cc bikes due to the increased displacement allowed in racing. Someone said the magic word! My favorite!! Using the current gen R6 for example, it wasn't a street oriented bike since it's power was from 8K to 14,200K. Anything below 8K felt like it was undergeared. Most of the smaller displacement I4 bikes are torqueless wonders yet only weight 410 lbs wet. Im just suprised you can say that so adamantly? Are you aware of less piston speeds, less piston loads, higher engine efficiencies with short stroke ect? Yes, I am aware of lower piston speeds and less piston load. Are you aware of the general rule of thumb that is a 90% bore stroke ratio? That means that the stroke should be 90% of the bore. This combination gives a reasonable amount of piston travel per degrees of rotation without being excessive. Are you aware that a short stoke motor requires a high dome to obtain a high compression ratio which comes with its own set of problems? Are you aware that sometimes the dome is so high that flame travel in the cylinder suffers? The piston does not move away from TDC as far (travels a shorter distance per degrees of rotation) so it may be plagued with valve to piston clearance problems that will be difficult (but surmountable) at best. Are you aware that it will have to operate at higher RPM (see motorcycle engines) to obtain the same HP because it will be smaller in cubic inches than say the 90% motor? RPM is expensive. Valves, valve springs, cams, retainers, pushrods etc etc must be of the very best (read expensive) quality to survive this. If the engine is only making the same HP as the larger one can at a lower RPM, then all one has accomplished is to build a difficult, expensive, high maintenance "grenade". However, the same problem exists at the other end of the scale. If the stroke is too long then the cylinder heads cannot keep up with the sheer volume of air being pumped . Often a stroker will produce the same power but at a lower RPM, because the cylinder heads have reached their peak at a lower RPM than would have happened on a stock stroke engine. So again, all modifications being equal, more displacement = more power. What? Are you talking about de-stroking a longer stroke motor? If by longer stroke motor you mean motors with strokes longer than their bores are wide? Yes, the majority of 2.0L 4-cylinder engines typically have a >100% stroke bore ratio. And we go round the circle again with the "no" usable low-midrange power, low torque nonsense again. But for the record, torque-less 2ZZ and I get along quite famously in both the low and high rpm ranges. Torque comes from capacity, not from stroke. I mean the difference between taking the FB20 with its 84 X 90 BXS and de-stroking it with a custom crank/rods, and designing one from scratch. I don't see the piston dome problem on a dedicated short-stroke motor. Example my old 1JZGTE was 86mm X 71.5mm, vs the 86mm X 86mm 2JZGTE. No piston issues with the 1JZ. Oh, I wasn't referring to shortening the stroke at the factory, totally talking about aftermarket. I would hope a dedicated short stroke engine would have those issues worked out before it went into production. On factory ones there are no issues to work out. Aftermarket de-stroking leads to a mis-match between stroke and intended deck-height. shorter stroke, longer rods, same deck height? That statement is entirely too general and I partially disagree with the boost handling part. What do you consider to be short stroke? 100mm bore x 80mm stroke? I prefer a "square" engines powerband characteristics, which is why I never stroked my 4g63, or swapped in a destroked 4g64. I have adequate power in the lowend and more than enough power in the high end. The 2.3 stroker version of my 63 gives up too much high end, the 2.1 destroked 4g64 gives up too much low end. Yes, a shorter stroke = higher revs. Yes, higher revs = more top end power. On the other hand... longer stroke = more low end torque = smoother transition from pre-boost to boost. Longer stroke/shorter stroke, unless taken to the extreme, doesn't make a car handle more/less boost. [Edit] Look at the 2JZ GTE, perfectly square 86mm x 86mm and it handles gobs of boost before needing to be rebuilt with beefier internals. Aftermarket de-stroking leads to a mis-match between stroke and intended deck-height. Right. Longer rods, taller pistons, or shortened deck height. I've never destroked a motor so I'm not sure exactly which is more cost effective.